Leaving Heraklion, the capital of Crete, and heading northwest this excursion brings us to Chania, Crete’s second largest city and the former capital of the island. The town is divided into the old town within the Venetian city walls which is an attractive maze of narrow streets, old mansions and arcades, with mosques and minarets bearing witness to the Turkish influence and the carefully laid out new town which is considered to be one of the most beautiful towns in Greece. 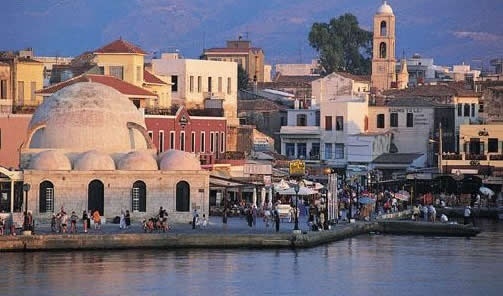 This “Little Venice of Crete” still has a wealth of Italian architecture. Get in touch with the Orient as you browse through the cross-shaped indoor market which is the ideal spot to find some unusual presents and souvenirs. “Leather Street” is a great place to look for those leather bargains: bags, belts or made to measure shoes. Lunch can be enjoyed in one of the many waterfront tavernas which overlook the old Venetian harbor where the film “Zorba the Greek” was filmed. You will have free time to visit the Agora (old local market) . Leaving this beautiful city, we continue onwards for a relaxing stop at the one and only fresh water lake on Crete, Kournas. Lake Kournas lies in a valley, in a beautiful area between the hills and the surrounding mountains and is reminiscent of a lake in the Alps. Here you can walk around the lake and see how the colour of the water changes according to the time of day, you can watch and feed the ducks, you can have a refreshing swim in the shallow water and enjoy a meal in one of the numerous tavernas close by, enjoying the lovely views. On our way back, we stop in Rethymnon, the third biggest town on Crete. There you can observe a unique and exciting blend of Byzantine, Venetian, and Turkish cultures. The old town has remained almost unaltered for 800 years. A walk around the harbour or a coffee break by the seaside will be the end of a perfect day.